UPDATE – Since writing this review, one understands that it has lost its Michelin star. Not quite due to this review I am sure. Alas, many moons have passed since one’s first visit to Medlar in the Kings Road, London which was a joyous and wholly successful venture. So wonderful was the ambience, the service and the food that your Doctor wholeheartedly recommended it to his chums. They in turn returned from their visits effervescing with its virtues. Quite rightly Medlar has now received a Michelin star to boot. Hurrah! So the return visit included one’s gastronomic chums The Inscrutable one and Masterton fresh from a jaunt to the hula hooping lands of Hawaii. We were seated at a congenial table in the main restaurant and prepared ourselves for gastronomic heaven. 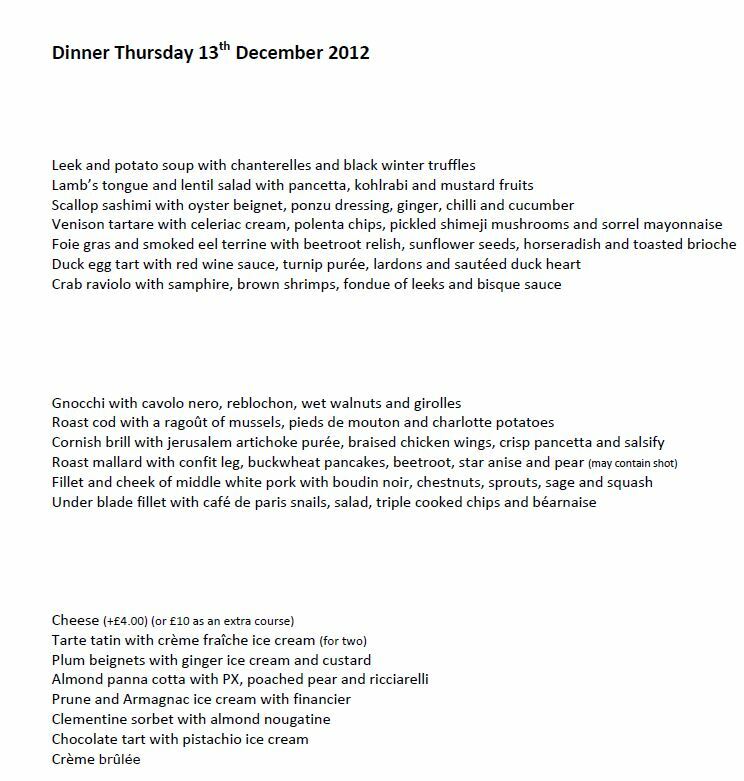 The tariff was £42 for three courses chosen from a varied menu which on closer examination revealed some esoteric ingredients. BUT…woah there horsey!! A faller at the first hurdle. Masterton and Fortescue both had their heads buried in the menu with quizzical looks. These chums are traditional meat eaters and the menu had Fortescue flummoxed and Masterton turning up his nose. “There is nothing I like the sound of” he declared. Now this was understandable, Masterton is not given to overblown verbiage on menus and Joe and David (the owners) had decided to celebrate their newly given star with a display of flowery phraseology to baffle the gods. The web site states that Joe tries to produce food “without over-elaboration or pretension”. Well woah there a second time…what are these menu options if not exactly that. The “may contain shot” comment is particularly ribald but maybe understandable One has pasted the full menu below for one’s delectation. Out of interest, one reviewed one’s favourite restaurant’s menu (Le Gavroche) where, yes the menu is in French but underneath each menu item is a fairly straightforward description of the dish. Here is a link to their menu so one can compare. But enough…surely. It is the food that speaks for itself and one should not be too pernickety. After all they now sport a Michelin star. Far in excess of what one might expect in McSpigget’s with their faggots and pease pudding sloshed down with sickly porter! So we drank a good Muscadet de sevre et maine (sur lie) and the food arrived. The foie gras was chosen by one’s companions. It came accompanied by a rather large brioche slice. Surely some mistake? How could one eat that? Yet they did. Your doctor dived in and thought the foie gras was excellent and the brioche was deceptively light and tasty. One’s own crab raviolo was tasty but missed something. Possibly the pasta was slightly too chewy and thick? The bisque sauce too creamy? But onwards. One must not get too precious! The inscrutable one of course chose the Gurnard. Being Japanese, he knows fish. He was silent during his deliberations and one knew he would rather have some sashimi. He left much of what was on the plate. Grit in the mussels. He explained this as the waitress removed his plate and questioned if it had been satisfactory. So, that left the two meat eaters. Both selected the pork which, when presented brought an expression of mild surprise. The portions were …delicate…almost ladylike in their size and the accompanying sprouts were spartan. The damage had been done for Masterton who refused pudding. A shared plate of some very good french cheeses cheered up your dear Doctor who shared a plate with The Inscrutable One. Fortescue, being an ex banker ordered the prune and armagnac ice cream with financier..whatever that may be. If it sounds like money Fortescue will opt for it. So, there it is. A disappointment. Sadly. Very very disappointingly disappointing. This was set to be in your Doctor’s top 10. Surely this was a one-off disappointment. Surely this wonderful restaurant cannot have changed for the worse. Is one’s memory failing one? One has decided that ONE MUST RETURN to give it another chance. The staff were excellent and the ambience was good. Maybe we, together had a bad night…. maybe we just chose the wrong things..maybe…keep watching the blog dear readers…and here once more…the unpretentious menu..